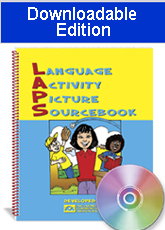 The downloadable edition of LAPS includes the entire book. Save money now! Ages 3 through 14. Here is a collection of task items, pictures, and reproducible record forms that you'll use on a daily basis to develop individualized programs for students with language disorders or ESL needs. Skills emphasized include telling stories in sequence, describing similarities and differences, making comparisons, using specific grammatical structures, using basic concepts, describing actions, locations and events, solving problems, and MORE. All of the pictures may be reproduced. Naming and Describing Nouns. Pictures of common nouns are included in this section. Ask the student to label each noun and to describe its function. Word Categories. The pictures in this section are organized by word categories. After placing pictures from various categories on the table in random order, ask the student to group them by category. Singular/plural Nouns in Action. Use these pictures to teach present tense verb forms, regular past tense verb forms, present progressive, pronouns, and other structures. Possessive Pronouns. Use these pictures to teach the possessive form. Basic Concepts in Sentences. Use the pictures in this sections to strengthen use of basic concepts in simple sentences. Irregular Verbs. Use the pictures in this section to teach irregular past tense verb forms. Object Comparisons. Ask the student to describe how the nouns in each pair are the same and how they are different. Picture Scene Comparisons. Ask the student to describe how the two picture scenes in each pair are the same and how they are different. Problem Solving Picture Scenes. Ask the student to propose a solution for the problem presented in each of these picture scenes. Tell a Story. Each of the reproducible pictures in this section includes a picture and an incomplete story. Ask the student to retell the incomplete story and to add an ending. Story Sequencing. Each of the 10 stories in this section is represented in four pictures. The student may be asked to use the pictures to create an original story or to retell a story created by the instructor. The entire book is included in the download.